Jumping on a moving wagon. Going with the flow. Joining a growing trend. In politics, when a candidate gains a threshold of popularity he becomes even more popular based on his popularity. In the Arts, when the underground starts buzzing, it’s a road sign, pointing the way toward economic development. Whenever we congregate together, to celebrate our spiritual existence, our cultural connections, our finest traditions, we create momentum to take us a little further down the road together. The destination really depends on what people decide to do or not do on a daily basis. Here at Listen & Be Heard, what we’re doing is facilitating fraternization, fertilizing the fields and extending an invitation to you to plant your seeds in today’s garden, knowing that the harvest will extend way beyond this year’s bounty. The purpose of establishing an annual event, in my mind, is to promote a steady, organic growth from year to year. So the first year, you make something happen. You talk to your neighbors, and establish what you can without over-extending yourself on the budget. Voila, the First Annual Listen & Be Heard Marin Street Summer Arts Festival. Since writing about the festival last week, The Honey Mill, a fine gift boutique at 623 Marin Street, has made a commitment to be a part of the day’s festivities on Saturday, August 18, 2007. They will have a variety of vendors in front of the store during daylight hours, and have contributed toward the cost of printing another banner. Sponsors for the festival now also include Rick Mariani Photography, Ambassador’s Rolls Limousine Service, Wiggins-Knipp Funeral Home and Digital Copy. So we have managed to raise enough money for the printing of three more banners to hang on Marin Street. Keep your eyes open for the hanging of those banners in the next couple days. It’s not too late for Marin Street businesses to offer their sidewalk, and/or to sponsor part or all of the cost of a banner, which Digital Copy is offering at the discounted rate of $50. For more information about sponsorship, please stop by Listen & Be Heard Poetry Café for the form, or download the pdf file. 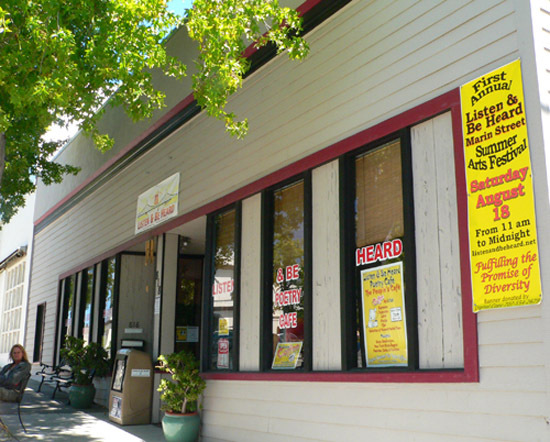 You can send us a check, stop by with cash or credit card, or call in a credit card payment at 707-554-4840. Vendors and organizations who have made a commitment to setting up a table of wares or literature include Abubot House of Imported Filipino Handicrafts, Cinnabar Tarot Decks, Sheila Ryan Photography, The Sufi Order of Vallejo and Peace & Poetry Greeting Cards. Adolfo will also be assembling a special group of exhibitors in front of his gallery at 920 Marin Street, and the Vallejo Naval & Historical Museum will do the same. More space has been made available by business owners and landlords on Marin Street, waiting only for serious artists and groups to reserve their spot at no cost (bring your own table.) Downtown businesses located elsewhere than Marin Street are also welcome to reserve a spot for a vendors table. Please stop by Listen & Be Heard Poetry Café at 818 Marin Street and pick up an application, or print the pdf file, fill it out and fax it to the number on the application. Those people who take the leap this year and join in to establish an annual event designed to promote growth and prosperity in Downtown Vallejo, will already be part of the infrastructure for next year’s festival. We invite you to stop waiting on the platform and board the Arts Train, destination: Fulfilling the Promise of Diversity. ps Please join me for a Storytelling Circle this Saturday at 2:30pm.